Welcome to The Infants' Home weekly news roundup. 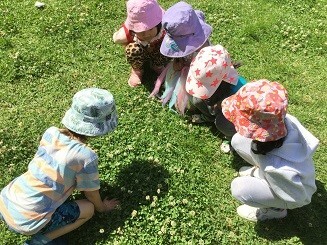 The children in Gorton House Preschool have continue to be interested in and engage in learning around the many insects and small creatures that live amongst us. 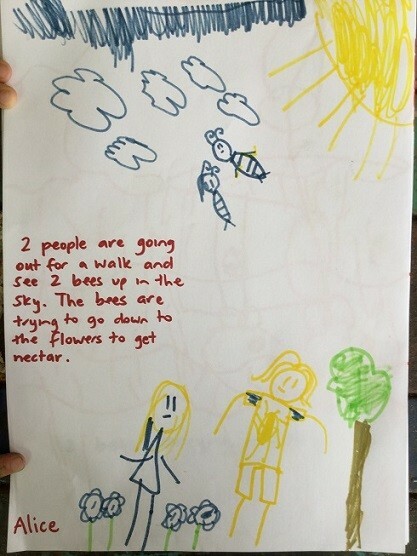 We have observed, read about, and nurtured bees, silk worms, ants and lizards. We have scrutinized little frog bodies found nearby and hypothesised about what might have caused their deaths. We have explored the important role that all these creatures play in sustaining and maintaining a balance within our eco-systems. We have been learning about the many varieties of bees, including native stingless Sugarbag bees, and we discovered a native bee hive right within the grounds of The Infants’ Home. We have learnt that sometimes it is difficult for bees to find a food source and we have helped increase and nurture the gardens in Gorton House Preschool as well as looking after the gardens within The Infants’ Home grounds by watering them. 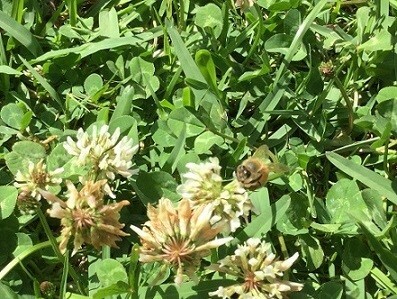 We have learnt that there are bees that live in colonies and others that are solitary, and we have been finding ways to support the survival of all bee species by caring for their food sources (flowering plants and trees that produce pollen and nectar). We were especially lucky this week to be gifted with a “bee house.” The children eagerly gathered around to explore the house and share their own understandings. Before finding a space to place this house (which provides shelter and nesting places for solitary bees), I listened as one child explained to his peers “See all these little holes, the bees that live alone will go in there at night and they will lay their baby eggs in there.” The children then discussed the fact that bees make honey to feed their babies. Our children have also been paying a lot of attention to the frog pond and finding a frog (despite the fact it was dead) enthused us because it proves frogs have actually been here. We are hoping to see more frogs (alive of course!) and we have also been seeking avenues to access local tadpoles in the hope we can raise them to froglets and provide a home for them in the pond! 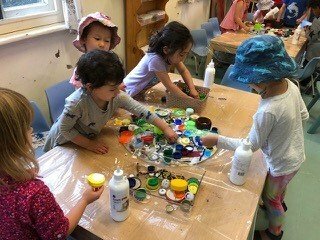 In Johnson House preschool, the children have continued to explore loose parts and to use these in a range of art experiences. What are ‘loose parts’ you might ask? According to Daly & Beloglovsky (2015), loose parts mean alluring, beautiful, found objects and materials that children can move, manipulate, control, and change while they play. Children can carry, combine, redesign, line up, take apart, and put together loose parts in almost endless ways. The materials come with no specific set of directions, and they can be used alone or combined with other materials. 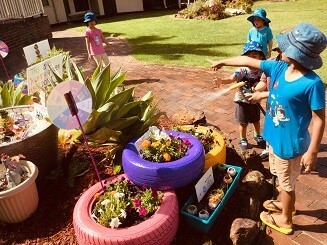 At the recent Arts Festival, held at The Infants’ Home, the children were inspired and encouraged to use a range of recycled materials and loose parts to create unique and interesting artworks. 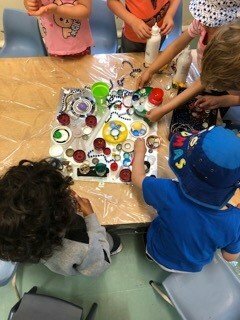 The children in Johnson House were excited to continue to add to these during the week as they glued, arranged and thoughtfully added to the collaborative pieces, discussing what the loose parts were, and where they thought they had came from. 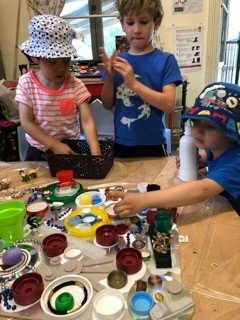 The children engaged in active conversations, worked cooperatively, and demonstrated creativity and innovative thinking. 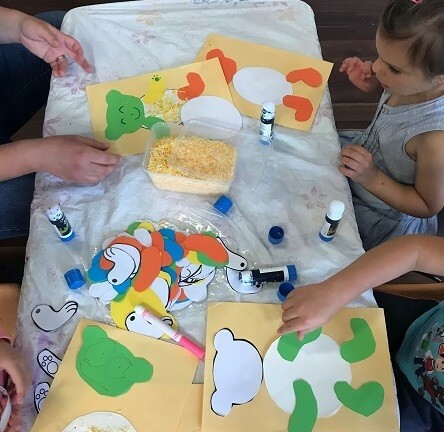 We believe that children benefit from ‘loose part play’, which means using materials that can be moved, carried, combined, pulled apart and put back together to be used in any way that supports children’s use of imagination and creativity. 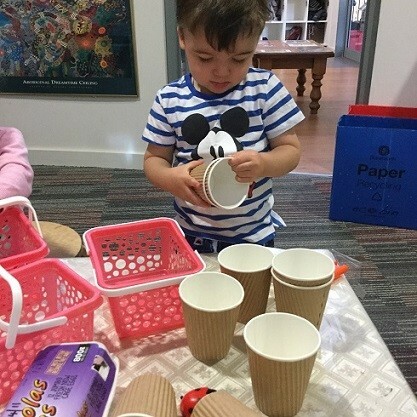 Some of these materials are familiar objects that children may have found and observed in their homes and environment, such as empty coffee cups, old keyboards, old phones, small baskets, etc. 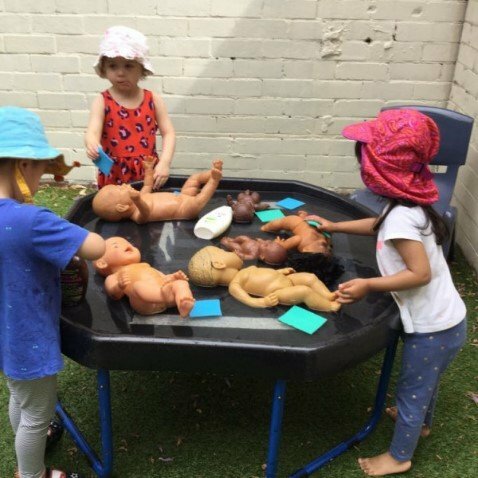 Children have been observed incorporating these props in their dramatic play, creating their own narratives drawn from real life experiences, such as ‘going shopping’. 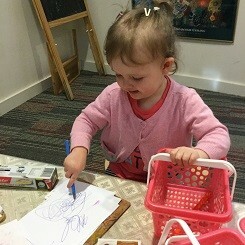 One morning a group of children were found creating a shopping list and using the small basket to collect objects in the room. One child used a piece of paper and pen to create a shopping list, whilst the other said that he was “Making coffee”. His peer announced that she was going to shop for a “baby shark” and another was looking to “buy a yellow pen”. 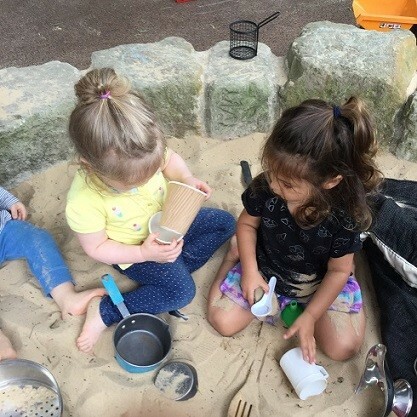 It’s lovely to observe children immersing themselves in heuristic play (which means using familiar objects in different ways), and in exploring their world and developing an understanding of how things work. 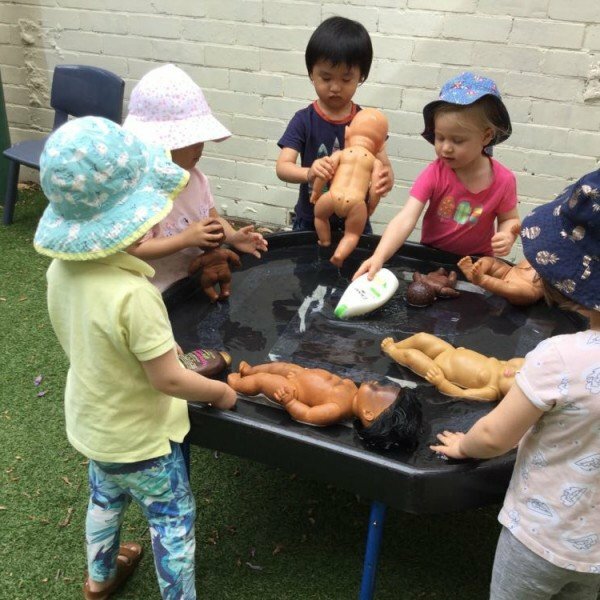 With the end of year quickly approaching, the toddlers have started their transition visits to their new centre for next year. 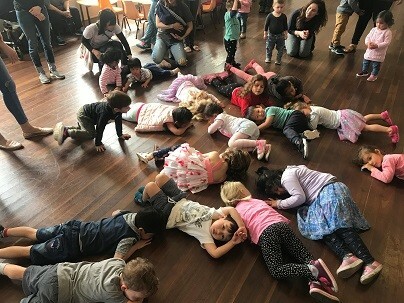 Children were observed showing excitement as they explored the bigger space, new equipment and resources to play with, as well getting to know new peers and educators in Robinson House. 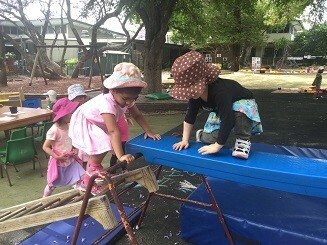 They are learning new rules, such as “One at a time” when jumping off the balance board and onto the crash mat – an exciting way to develop proprioceptive (internal body) awareness! Soon the children were reminding their peers: “Jump one at a time ! You first!” Lots of giggles and laughter were shared as they crashed into the big cushy mat. 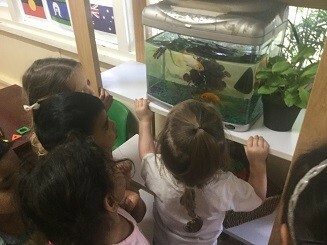 The indoor area in Robinson House is equally fascinating for the children to explore, with a fish tank that looks quite similar to the one we have at Murray House, but smaller Lego pieces to build with, as well as getting to know the names of the children in Robinson House at the moment. 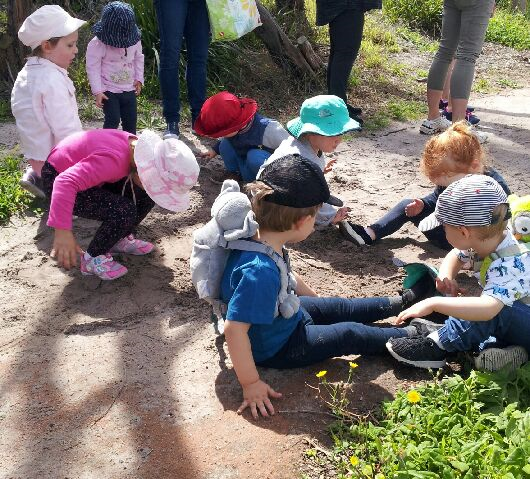 Recently Randwick/South Sydney Family Day Care children enjoyed an excursion to the Guriwal Bush Tucker Trail at Yarra Bay. 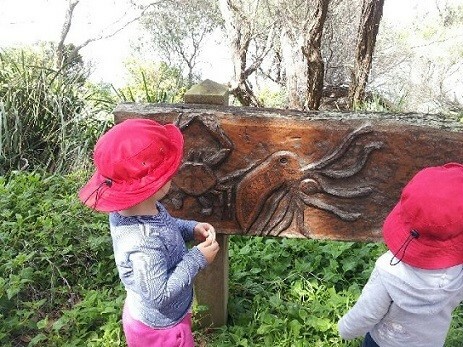 The children actively collected natural treasures and studied the many carvings of local fauna that are positioned along the walk. Everyone enthusiastically joined in our singing of animal songs when we stopped for a rest at a fire pit. Revived, the children then initiated their own play in making an impromptu sandpit on the path, which was a wonderful shared experience. This week at playgroup the children have enjoyed making teddy bears. 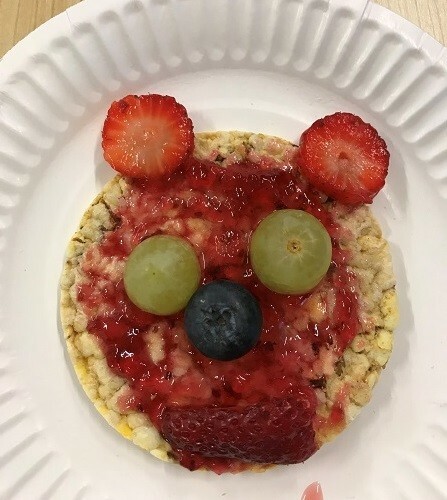 At the craft table, coconut teddy bears were created and the children made creative bear faces using fruit and crackers. We read the classic children’s story ‘We’re going on a bear hunt’, as well as ‘Always there bear’. Everyone’s favourite action song ‘Rock-a-bye your bear’ was also enjoyed by all.